Welcome to love it keep it! Right now all I can think about is an upcoming vacation we have planned. We are going to Maui and are so excited! This will be the first real trip the husband and I have taken together since our honeymoon almost two years ago. Isn’t that sad? I guess when of you starts a new job, you buy a house, and get a puppy, it makes it hard to travel! 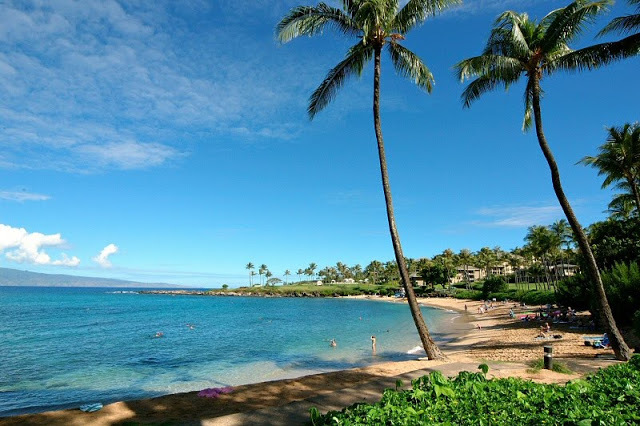 We will be staying in Lahaina at the Westin Maui Resort & Spa and can’t wait for some great views, yummy food, and pool time. I’ve already scheduled us a zip line tour and snorkeling trip. We probably will also do the road to Hana and maybe fit in a luau. So, I need some suggestions from you all! Where should we eat? What should we do? Anything we must see while we are there? « Wordless Wednesday: What a life…. That will be a BLAST! I'm so jealous. I desperately need a vacation. I haven't spent any time on Maui, so I don't have any suggestions… but just relax, take a stack of books, and soak it up! That sounds heavenly!!! My parents honeymooned in Hawaii and have been many times (when we lived in CA) but I've never been. I hope B and I get to go one day. Enjoy your fabulous vacation!! SOOOO jealous. Can I ride in your suitcase? LOL Have an AMAZING time!! If you do the road to Hana, rent your own Jeep and take it yourself. Eric and I were tortured for over 5 hrs on a tour with the MOST frustrating people… not the way a couple of love birds wanted to spend the better part of the day, lol. That is SO exciting!!!! I'm jealous! 🙂 I know it will be beautiful and so relaxing!!! Hope you have an amazing time!!! i have never been but if i have im pretty sure my suggestions would still go something like this…. then, do it all over again. a few times. Sounds like so much fun!!!! You two deserve it 🙂 I think a Luau is a must but then again I have never been to Hawaii. happy almost vacation! you two will have a blast. make sure you snorkel in turtle bay and see the sea turtles!! Delighted to learn of your visit to Maui. – a day in upcountry Maui: start with a guided morning tour with lavender tea and scone at Ali'i Kula Lavender Farm, followed by a visit to Surfing Goat Dairy for local flavored cheese sampling, then off to Maui Winery in Ulupalakua and ending with a drive up Haleakala for stunning sunset views. – visit to Paia town with its rustic feel. Park and walk around. If you are hungry, Fish Market and Chez des Amis with savory and sweet crepes are my picks. – visit to Lahaina town. As you are staying at Westin Maui, take advantage of the resort's complimentary shuttle that runs hourly. The shuttle makes three stops – take the Hilo Hattie stop as it is in the middle of the town and makes it easy to explore from one end to the other. The Lahaina Visitor Center offers a self-guided trail to the historical sites as the town was once a whaling port and royal capital. It also offers great art galleries, shops, restaurants and nightlife with entertainment. – I see you have luau in your list. Westin Maui offers Wailele Luau Tuesday and Thursday evenings. It is held oceanfront and diner is served course-by-course at the table instead of the usual buffet. The performances are superb and offers Maui's only fire knife dance finale. – Sunset cruise. Gemini and Teralani have catamarans that come up right to the beach facing Westin Maui. The 2-hour cruise is perfect to catch sunset and enjoy an evening in Maui. Drinks and appetizers are served onboard. – A trip to the Heavenly Spa is a must. The Heavenly Body Wrap uses Maui sugar and body butter made locally. Their massages are great too – ask for their discounted monthly specials when you get there. – Whale watching is between end of November and early March. If your visit falls during this time, the experience would be unforgettable. We look forward to welcoming you and your husband to The Westin Maui Resort & Spa.